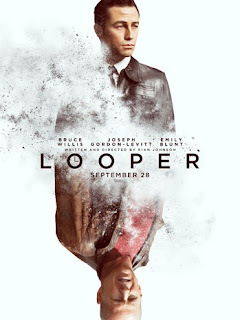 In a Kansas cornfield in the year 2044, a hitman named Joe (Joseph Gordon Levitt) waits for his target to pop into existence in front of him, sent back in time by the organized crime syndicate he works for. As Joe informs us in voiceover narration, time travel will be invented 30 years from his present, and quickly made illegal. But when time travel is outlawed, only outlaws will have time travel. One of the more interesting aspects of Joe's line of work is the very real possibility that his next victim may be the older version of himself. After all, there can't be any loose ends in a highly illegal enterprise like this. When that happens, the hitman gets a particularly large payday to retire on for their remaining days, and the “loop” of their life is closed (hence the name looper). And since all the victims come through with their faces covered and are killed instantly before they can utter a sound, the looper won't know that he's committed “suicide” until it's over, not that any of them seem to care much. When Joe's future self is sent back, things don't go quite so smoothly. Old Joe (Bruce Willis) isn't bound and doesn't have his face covered, and using the element of surprise to his advantage, he avoids being killed and manages to knock his younger self unconscious. Having recently seen how ugly things can get for a looper who allows their future self to escape, when young Joe awakens he ignores the advice of his future self to hop a train and get out of town, and instead sets off in pursuit. Although both versions of Joe are nowhere close to being good or heroic, they do have motives for what they wind up doing that are understandable. Old Joe wants to prevent the death of his wife (Qing Xu). Young Joe at first just wants to avoid dying before he even gets a chance to become Old Joe. As he learns exactly what Old Joe plans on doing to insure that his wife lives, however,Young Joe also becomes protective of hardened farmer Sara (Emily Blunt) and her telekinetic son Cid (Pierce Gagnon). That's about all I want to give you by way of a plot synopsis, as it wouldn't be fair to spoil any more of the twists and turns of this story. As with his debut film BRICK, writer/director Rian Johnson shows an affinity for hardboiled dialog and film noir conceits, albeit this time melded with a science fiction scenario. The way the future world his characters inhabit is depicted feels extremely believable and real. No robots or laser guns or cheesy “futuristic” clothing; this future feels lived in, with old technology retrofitted to work with solar panels and other rough around the edges touches that show the world has moved forward in some ways, but not in others. Johnson also manages to find a fresh angle on the well worn time travel genre that doesn't try to ignore the inherent paradoxes in such scenarios, but rather embraces them. It's smart and clever, but also accessible. There isn't any grand message the film is trying to impart; it just wants to entertain without insulting its audience's intelligence. If one were to travel back in time 30 or 40 years, such a thing would be fairly commonplace, but here in the present it's a considerably rarer commodity. 3 1/2 out of 4 stars. Great review Bob. Didn’t have me as emotionally-invested as I thought I could have been, but still, a pretty solid sci-fi flick that’s heavy on story and characters, which is all that mattered to me. Yeah, definitely a movie that works more on a plot and idea level than on the emotional, but I'm fine with that when it's done as well as it is here.